So this was the opening show of the European ABB leg 2007. I am doing the whole tour this year; if I always get to see such a great show, what can I ask for more?? I'm not gonna say "Keith missed his tunes in that and that song" or " Ronnie was better but still not excellent" - others are here to go in this details. But I'm gonna say "This was a great, excellent opening show". The sound was absolutely fantastic, crystal clear. Mick was a sensation for itself, his moves and dancing, fantastic! His voice so clear. This guy is 64? Never ever! Ronnie played much better than last year - his solo on "CYHMK" brilliant. He was kind of embarrassed when we sang him a late "Happy Birthday" - looking like a young child. And Charlie - what to say about Charlie? He kept the whole thing running as always; he even came down from his podium during the band introductions, with a big smile on his face. I liked "Sympathy" (my all time Stones favourite) as the encore; although last year's arrangement sounded more "devilish". Also "Paint it black" was one of my favourites - Mick giving it a new dimension with new, accurate moves towards the end. We had no traffic problems as we arrived at about 10 a.m.and parked the car nearby the venue. After the show we took our time, had a 2hours sleep in the car and then went back to the airport without any problems. For me personally the Werchter show was a great opener with a perfect setlist - hope we get to hear all the songs they rehearsed during this summer! Really looking forward to the next 29 concerts. 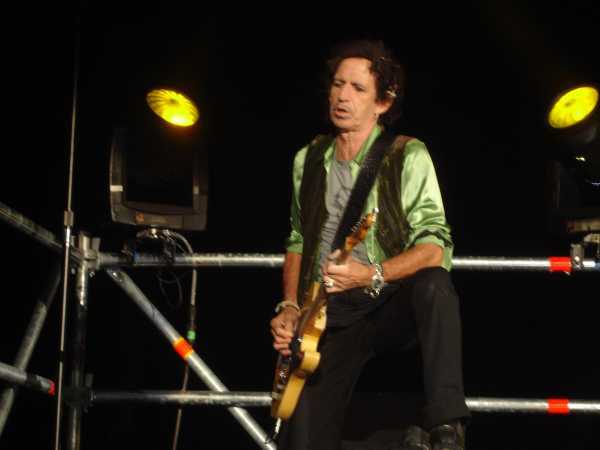 The Stones started great in Werchter, Belgium. It was not easy to go Werchter. There were huge traffic jams all around. On the highway I was anxious and wondering whether I was going to get the place of the gig on time. At last I arrived exactly when Van Morrison came on stage to make the first part of the evening. I could relax waiting for the Stones. The weather was fine after having been stormy and rainy the week before. The Stones came on stage at 10:10pm, a very long while after Van Morrison�s gig. The bigger bang burst out again with the first Keith�s riffs in a terrific sound. The Stones started with Start me up. Shattered was second on the set-list; the sound and the rhythm were quite great. So it was with Rough justice. After Rocks off, Mick said a few Flemish words, which was appreciated by the local audience. Mick did it several times in the evening. Some girls was played, which is not usual on stage. It sounded different than the original version and was interesting. Then came Waiting on a friend and a great Can�t you hear me knocking. Ronnie did a great solo. Tumbling dice was played as expected with every gig. The Stones made a tribute to James Brown. The played �I go crazy� for the first time. Then after introduction, the highlight of the show was Keith himself. His voice and his way to move were so different than they were last year. But, anyway, he played as good as usual. Keith is the greatest performer in the world. He sang I want hold you and Slipping away. He got a great ovation. The rest of the show was also absolutely great: It�s only R�n�R, going to B stage, then It�s all over now, Satisfaction, and Honky-tonk women going back to main stage. Then Paint it black, JJF, Brown sugar. And for the first time, the encore was Sympathy for the devil. I really enjoyed the whole show. This was not a good show for casual Stones fans. With a diverse and challenging set list that included "Some Girls" and "Can't You Hear Me Knocking" -- tunes that I had not heard in some years -- many people may have wondered what the hell was going on. The rest of us had a blast at the half-empty venue. It's clear the warhorses are here to stay, though the Stones shuffled things quite a bit, playing "It's Only Rock'n Roll" on the way to the small stage, and wrapping with "Sympathy for the Devil." Perhaps inevitably, the show had pacing problems particularly when they returned to the big stage and we had to wait an eternity for "Paint It, Black" to start. I would estimate the gaps between the songs added 15 minutes to the 2:10 playing time. The show began at 10:10 with "Start Me Up" - no surprises there, and the crowd went crazy. But then they fell completely silent for "Shattered," which was eerie. By the time Mick finished uttering a few greetings in Flemish and French, he seemed winded. He donned the guitar for "Rough Justice," the only song from the "new" album, which begs the question -- why can't they give this tour a different name, like they did in 1990 with Urban Jungle? "Some Girls" was a thrill. I haven't heard this song since 1999. But as he did then, Mick ditched the "black girls just wanna get f**ked all night" line, substituting a second reading of the "English girls/telephone" line. "Waiting on a Friend" was better received, though it didn't help the show's flagging tempo. People appreciated "Cant You Hear Me Knocking" -- another "rarity" by the Stones' lax standards. But Mick was grunting loudly all the way through his harp solo, which sounded like it could turn into the theme fron "Sesame Street" at any moment. Clearly, the main benefit of the song is that it allows him to get by without singing for a good five minutes. After "Tumbling Dice," Mick asked whether anyone was from Brussels or Antwerp, and then delivered a nice surprise in the form of "I'll Go Crazy," a tribute to James Brown. They smoked on this one, at least until the midsection when Lisa took center stage and howled like an "American Idol" contestant. But the crowd loves her schtick, and she got perhaps the loudest cheers of the evening. Another question - why didn't they ever do a tribute to Billy Preston last year? Keith began his segment saying, "Good evening. It must be good because I'm here. It's a nice night, and it's a great, great way to kick off." Still, his two songs went on forever. I was starting to feel the jet lag after flying in from L.A. earlier in the day, and I'm not sure how many more times I can tolerate "Slipping Away." Before he started that song, he said, "It's the first night. The guys are nervous, and I don't know what about." Before they began "Its Only Rock'n Roll," the crew pushed Charlie's kit to the front of the stage in preparation for the big trip. "It's All Over Now" was yet another pleasant surprise. "Satisfaction" -- shock!! -- was the best-received song of the night. The show ended with the usual golden-oldies, and the fireworks came on prematurely before the bows. The night was still young for me. The local authorities, in all their wisdom, declined to service the rural location with buses, so I was forced to walk 15 km back to the nearby town of Leuven, getting there at about 3 a.m. Nice one, idiots. My god, it�s not easy to reach Wertchter. Hopefully, my brother and me we arrive soon near the show place, around 17h30. So, no traffic problem on the highway. The weather was fine, no rain ! First, I must say that I really enjoy Van Morrison show, big respect for the man. Great opener, great musician, great blues singer. Thanks man. The end of the gig was really good, especially during It's Only Rock'n Roll on the B-stage. I heard much better versions of Satisfaction but I was so happy to see them playing this great song ! I really enjoyed Paint in Black and JJF (good Ronnie on this one, Keith quite inaudible), and the great great encore with Sympathy for the devil. Mick was fantastic on this one, purely the best rock�n roll performer ! So a good show, for sure. Not the best I saw however. Mick and Charlie were perfect, Ronnie quite good, but his performance had to be good because Keith�s one was almost bad, really. Don�t like writing that. Love the Stones. Will see them again in Paris, in France, my country. Yes ! Thanks to Axel Schumacher for supplying news links!